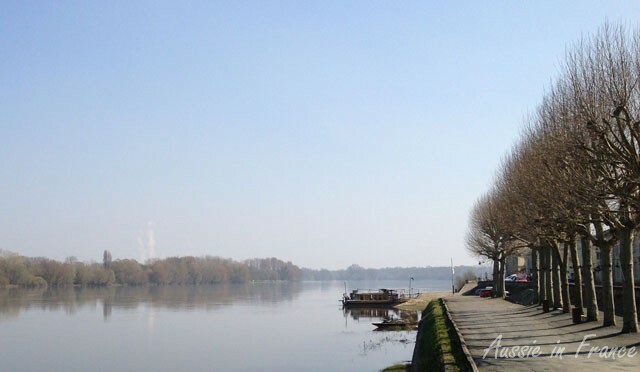 We’ve decided to take advantage of the wonderful spring weather and do some more cycling further along the Loire. 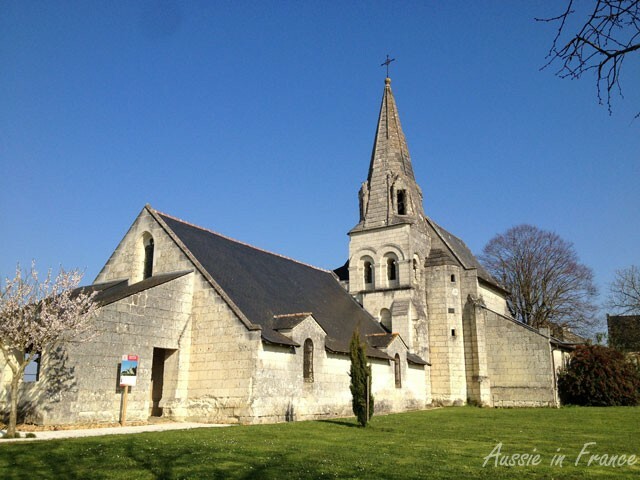 I’ve been wanting to go back to Fontevraud Abbey for some time so we book a chambre d’hôte in Turquant which is on the Loire about two hours west of Blois. We have a picnic lunch in nearby Montsoreau which was a thriving port for the transport of tufa stone, wine, timber and grain until the railways took over in the mid 19th century. Today, it’s a sleepy little village with a château that livens up in the summer. 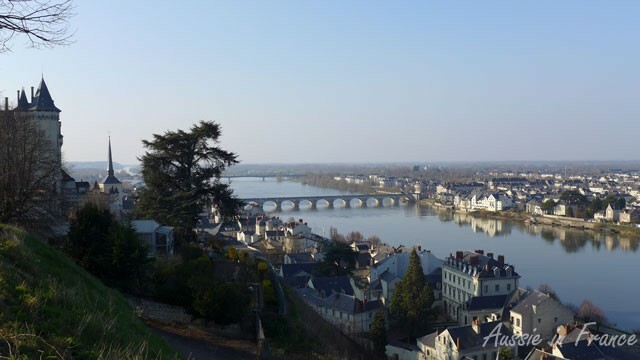 Then we drive up to one of our favourite panoramas just outside the neighbouring village of Candes overlooking the confluence of the Vienne and the Loire. Not as striking as it is in the summer, but still breathtaking. 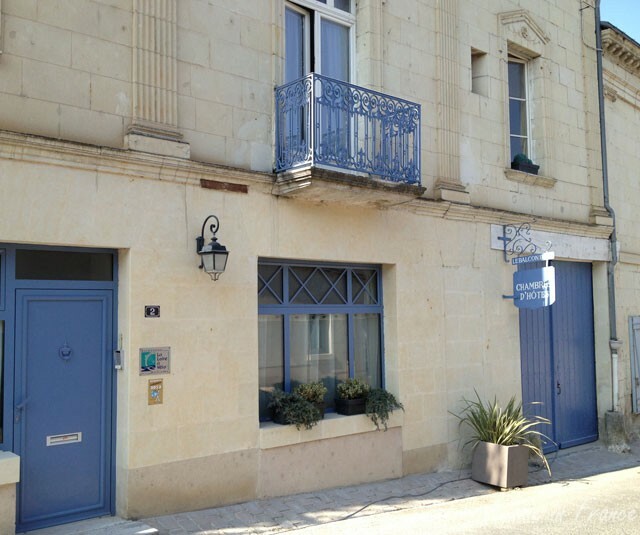 After checking into our lovely chambre d’hôte, Le Balcon Bleu, we take the bikes off the back of the car and set off for Saumur where Jean Michel lived from the age of 3 to 17. 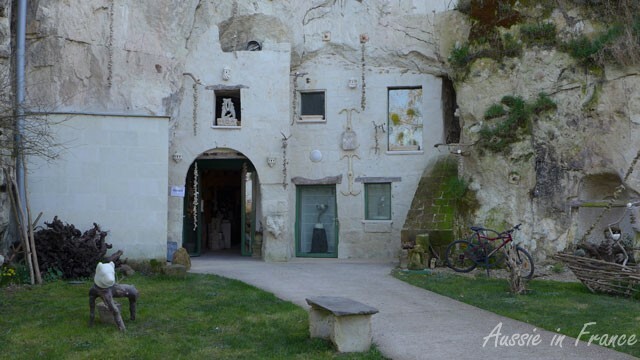 We take the “high” cycle route overlooking the Loire which takes us past an amazing collection of troglodyte dwellings that have been converted into artists’ and artisans’ studios. 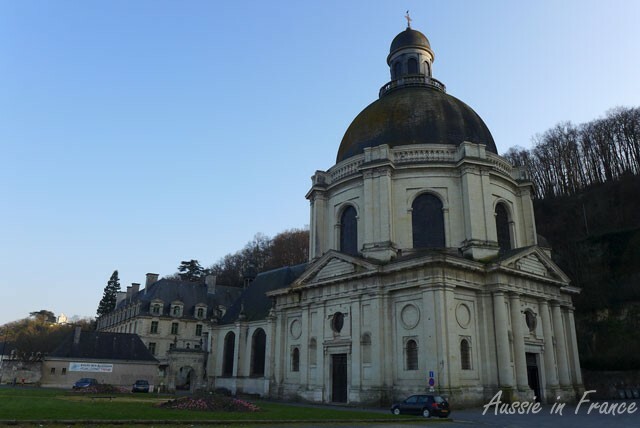 We cycle through the vineyards of saumur champigny and up and down an exhausting number of hills with an occasional stunning view of the river such as the vista from the narthex of the little church of Saint Pierre in Parnay built in the 10th century. Some time later, I spy a picnic table and suggest a pause. I’ve remembered the biscuits and water this time, which is a good thing because there is no other sustenance along the cycle route. Jean Michel says we are very close to his old home and tells me who owns the surrounding vineyards. A little further on, there are a lot of new houses which he’s never seen before. We arrive at his old home which was originally a cavier windmill like the one in Bléré and he shows me the roof he used to climb up on to read and look at the panoramic view. 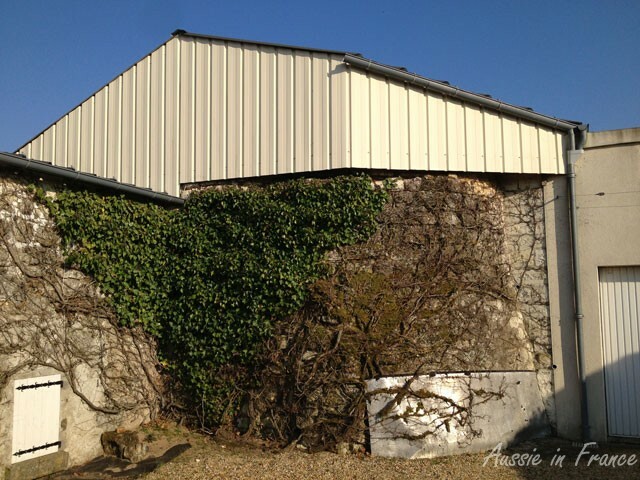 I can’t see any sign of a windmill but at the back of the house, he shows me part of the circular wall. Many additions have been made over the years so the house is quite a hotchpotch. 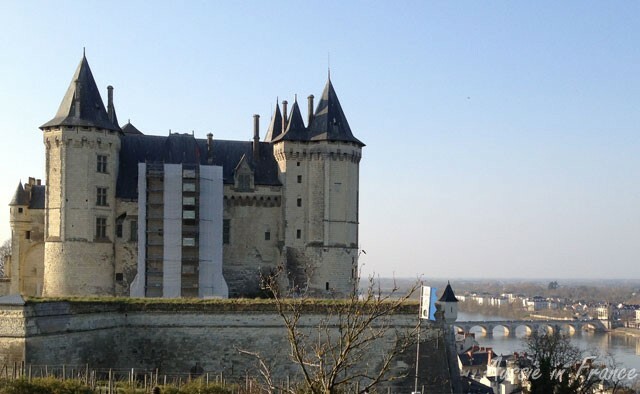 After turning right into the aptly named Rue des Moulins, we see the remains of several similar windmills, before coming out on Jean Michel’s favourite view of Saumur, the Loire and 14th century château. Unfortunately, it’s being renovated so the view is marred by scaffolding. 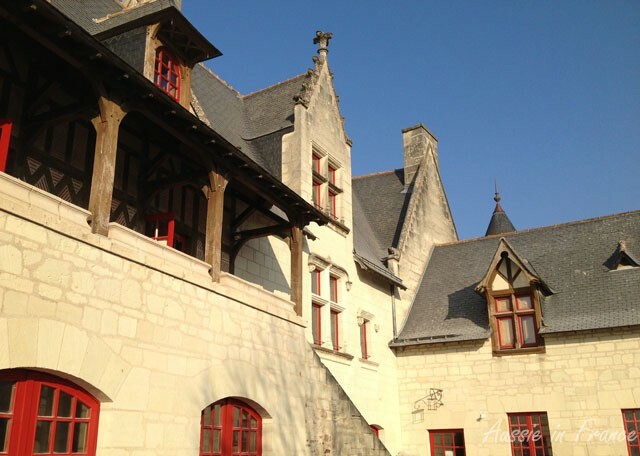 The bike path leads through a surprising mix of old and new buildings, including the beautifully renovated Maison des Compagnons (guild house) where the apprentice stone cutters are all chipping away in the open courtyard. We cycle through Place Saint Pierre with its half-timbered houses and down to the Loire then turn right along the river, with the castle towering above us until we reach the imposing 17th century church of Notre Dame des Ardilliers which I remember from a previous visit. The cycle route takes us up another hill and through a sort of tunnel, then past a series of troglodyte houses, much more sophisticated this time. Signs along the path point out architectural features such as mullion windows, watchtowers and arrow slits. 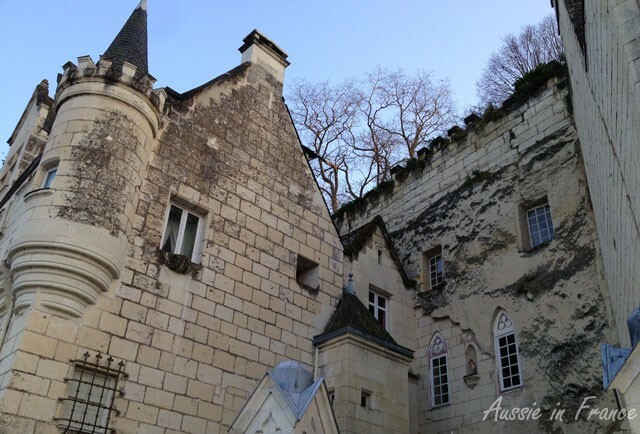 One of the troglodyte dwellings is actually a feudal castle owned by Marguérite d’Anjou, the French wife of Henri VI of England, in the 15th century! Just when I think the cycle route is going to join the river again and spare my knees, another hilly path takes us up a tiny winding street and we begin to have doubts. But an amazing sight is awaiting us! Stay tuned. 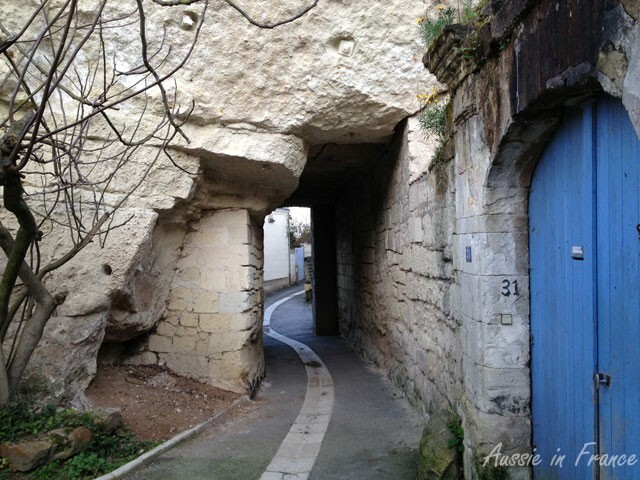 This entry was posted in Accommodation, Architecture, Cycling, Loire Valley, Uncategorized, Wine and tagged Loire à vélo, Montsoreau, Saint Pierre de Parnay, Saumur, turquant. Bookmark the permalink. 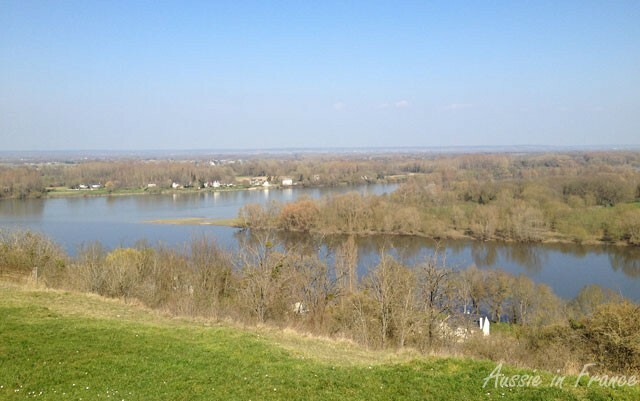 The view over the Loire at Saumur is absolutely stunning! No wonder JM loves it. Troglos for artists is a bit curious — you would think most artists needed a lot of light, which, with the best will in the world, you do not get in a troglo. PS. Might be worth clarifying the bit about Marguerite d’Anjou. She was the French wife of Henry VI of England. I had to read it three times before I twigged. We didn’t go into the studios so I wasn’t able to check. It didn’t occur to me actually! The following website gives more details: http://www.ot-saumur.fr/VILLAGE-METIERS-D-ART-DE-TURQUANT_a10237.html. I’ve clarified the bit about Marguerite d’Anjou as you suggested. Thank you.